optimizations of the FFT transform, as well as the convolution with small kernel (up to 5x5 and 3x3x3). This is awesome for us packagers! Anyway, from now I think I will release more frequent minor updates than before. I don’t plan to make big changes in G’MIC in the future, so I’ll probably try to improve it with a few optimizations and cleaning, which is perfectly adapted for minor releases ! No irony involved. It made my life as a packager easy. 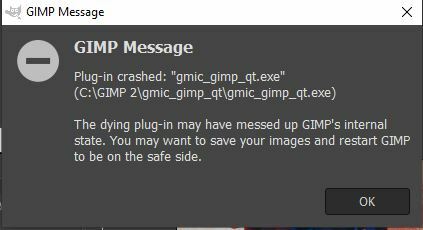 If you have installed the plug-in with the installer, then the file gmic_cluts.gmz should be already somewhere on your drive (in the plug-in folder gmic_gimp_qt/ ). Please check this is the case. Have you installed the plug-in in an ‘exotic’ location ? Yes, I used .zip archive version and under Folders/plugins I added the path. When I update the GMIC , new gmic_cluts.gmz is under this folder (which GMIC has generated alone) . But GMIC does not use gmic_cluts.gmz from this folder but rather connects to the net. In offline mode I got error therefore. G’MIC should read gmic_cluts.gmz from the %APPDATA%\gmic\ folder in order to decompress the desired CLUT. Won’t be able to check on Windows before next Monday, unfortunately. Could it be your username contains some unrecognized characters ? EDIT : Also, I’ve tried to modify the filter, maybe try updating the filters with the update button and tell me if that solves your problem. It works now offline !!! Thank you!!! I still don’t know exactly. It seems that the function isfile() I use to test the presence of the file gmic_cluts.gmz is not working for you. Could you please write the complete path to your %APPDATA%/gmic/ directory ? Maybe it contains some weird characters that G’MIC is not able to read. But it would help fixing this bug. Also, AppData\Roaming\gmic is now filled with more files than before. 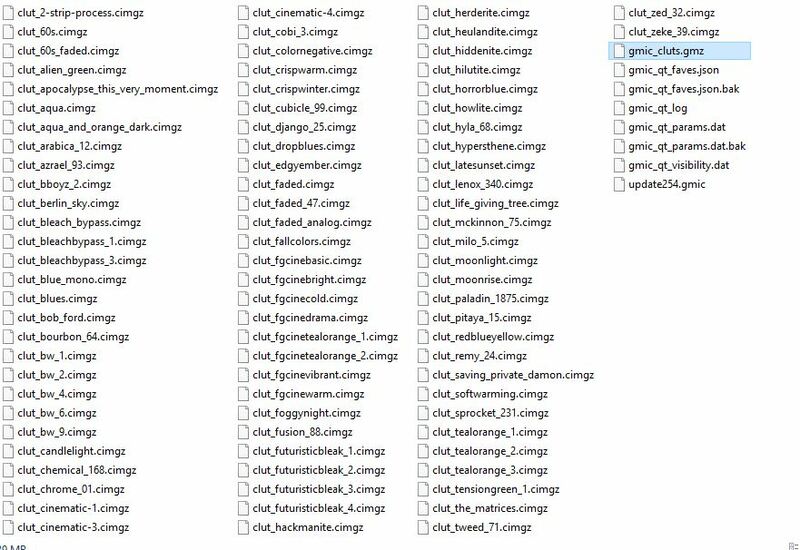 These files weren’t present before. 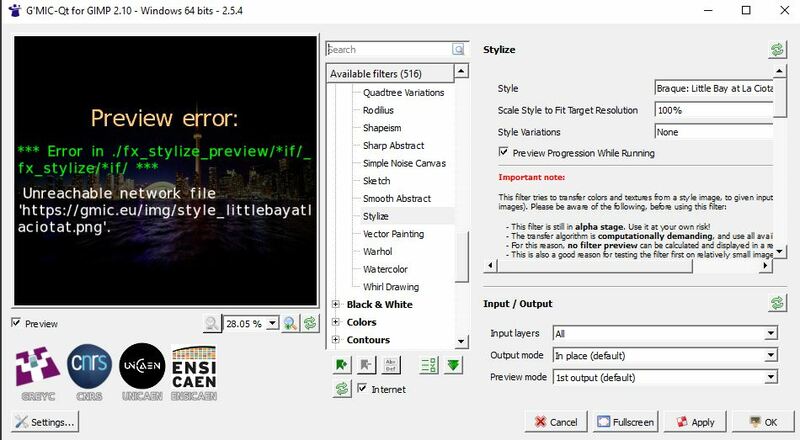 Stylize filter also tries to connect to network rather than working from GMIC. Once you’ve got all the style images, then you can go offline. 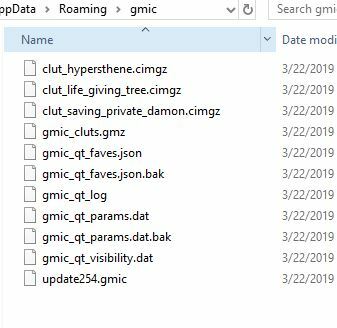 Hmm, a bit off topic: My system is cluttered with gmic_cluts.gmz files following the usage of cmic-cli and gmic gimp plugins with different GIMP builds and e.g. calls to clut. Either gmic should respect the definition of $GMIC_SYSTEM_PATH or -path_gimp should possibly not point to $TMPDIR (at least on my Mac) etc. Fixed ! Thanks for reporting! Changelog for 2.5.6 , released on 2019/04/08. New filter Deformations / Warp [interactive] allows to create custom deformation with an interactive keypoint editor. Command map now accepts multi-channels input images, and output then an image with nb_channels(input)*nb_channels(colormap) channels. Fix 2.5.4->2.5.5 regression in command map. Fix compilation warnings that appeared with latest version of clang.